While some may have seen Apple’s exclusion of NFC from the lastest iPhone as a slight, Miami-based Flomio saw an opportunity. As reported by BetaKit.com, the FloJack could be the solution that will enable iPhone users to have their cake and eat it too. The solution works much like the Square mobile reader— which allows vendors to accept credit card payments from Apple devices— by plugging a dongle into the iPhone’s headphone jack and interacting with Flomio’s proprietary app. The major difference between FloJack and Square, however, is that FloJack turns any iPhone, iPad or iTouch into an NFC-enabled device. Flomio has not yet publicly released solution, but for a pledge of $39 backers can receive a FloJack and programmable NFC tags, while pledges of $99 or more will gain you access to the company’s software development kit (SDK). Having only been launched on Oct. 25, the FloJack has been met with rather positive feedback. The company has already raised $12,000 of its desired $80,000 funding goal with 28 days remaining. In production since August of last year, the FloJack project was nearly scrapped, as rumors of NFC support on the iPhone were rampant prior to the phone’s release. When it was clear the latest iteration in the iPhone family shipped without NFC, Flomio sprung into action. Where the FloJack solution will fit into the mobile wallet ecosystem— and more importantly how it will fare against Apple’s Passbook— is yet to be determined. Long term, however, Flomio sees its solution as a platform to help consumers, merchants and other developers to jump into the NFC pool. 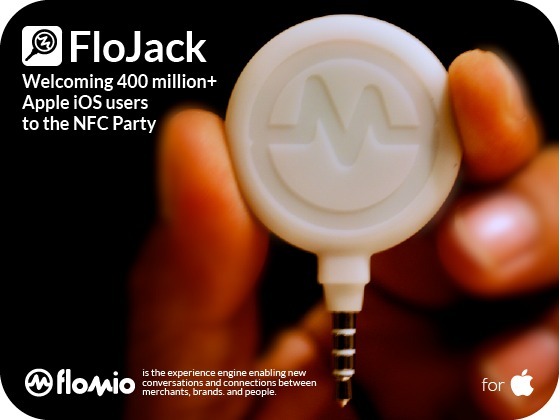 Using the FloJack as a means to gauge the public demand for NFC, Flomio believes that the solution will if nothing else prove worthwhile for iPhone 5 users as many consumers do not immediately upgrade to the latest device. Beyond the FloJack solution, Flomio is also planning to launch a cloud-based version of its NFC Actions app, which would lead to cheaper and smaller tags— branded as “Zapps”— with further plans to open an online store. For more information on the FloJack, read the full BetaKit.com article here.